Thank God I'm Natural: The Ultimate Guide to Caring for and Maintaining Natural Hair has been hailed by Essence magazine as "The Natural Hair Bible" and for good cause. Inside the 200 plus natural hair-care guide are product tips for natural hair, homemade hair care recipes and myths about going natural that author and Harvard law graduate Chris-Tia Donaldson debunks. 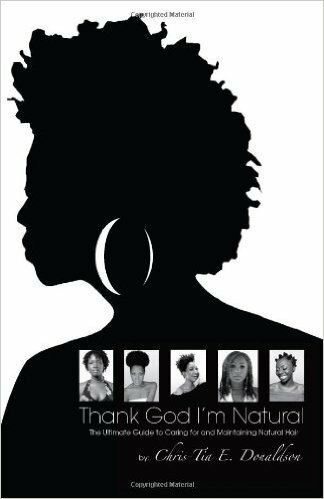 The book, which features the advice from celebrity stylists who have worked with Jill Scott, Lauryn Hill, Erykah Badu and others, helps women of all ages properly transition from relaxed to natural hair. Along with the book, readers can also visit tginblog.com for current information on natural hair care including trimming natural hair, how to develop a healthy hair routine after you've done your Big Chop and other useful tips. Both the book and website are for women who are tired of spending their entire Saturday in the hair salon only to find their hair is dry, damaged and breaking. Going natural is a life changing choice, that is filled with ups and downs, let Thank God I'm Natural be your guide to reaching your natural hair potential. Readers will get ALL the information they have always needed -- to look good on the outside and most importantly, feel good on the inside. You won't want to do your hair again until you have read this lifesaving, reference book and heartfelt narrative from cover to cover!